Last week we got a surprising, but very pleasant contact. 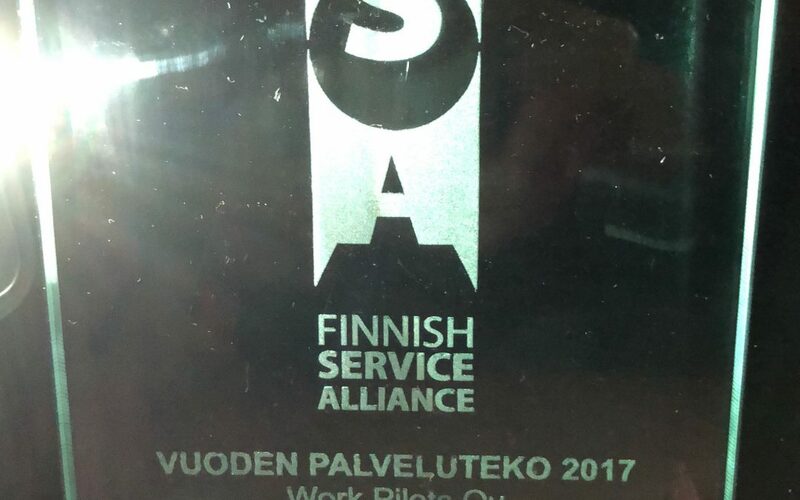 We had won the honorary award of service work of the year, given by The Finnish Service Alliance. 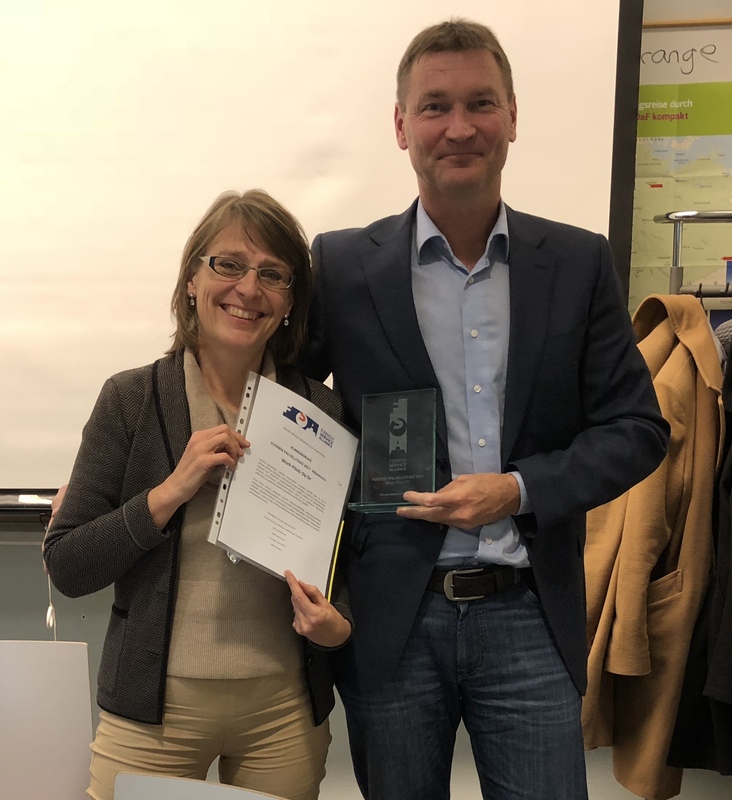 By that annually given trophy, Finnish Service Alliance wants to lift up successful service reformers and emphasize the service innovations’ significance to the society and the success of companies. Our whole team is very flattered and thankful for this acknowledgement, this is absolutely incredible. We have been working over two years building our service, and this kind of public recognition makes us feel really happy. Special thanks belongs to our awesome partners, who have been in significant role in the planning of our service since the beginning. In addition without support of our partners (cities, municipalities, companies, organizations, foundations and numerous private people) and of course without the support of numerous youngsters we would not be here. We would not exist without all of you and your courage to start trying new solutions in our common and important mission to get young people into work life. Kalle Nieminen from Sitra spoke about the reasons of judges’ selection (we didn’t know him before) and at that point my mouth snapped open – I couldn’t have described our thoughts that well myself. Wonderful! Finnish Service Alliance’s annual honorary award for service work in 2017 is given to Work Pilots Ltd. Work Pilots has created a solution, which grabs to one of the main problems of society’s challenges: employment of young people and that way to alienation of young people. In Finland and in western world generally, work has been important way to attach to the society and way to be part of society’s action. This way also the identity of Finnish person is built by work. This does not make the solution of Work Pilots more insignificant, vice versa, it highlights the significance of work as one of the important pieces of youngster’s life and growth. In addition to social effectivity, Work Pilots have successfully created a implementation which fulfills the requirements. It is shown for example as starting internationalization. When effectivity and successful implementation are combined in the solution, we can talk about successful social innovation. Work Pilots describes the service experience very well on their web page and especially in the videos. Different kind of material creates rousing and sparking story of service experience to the different user groups – youngsters, households and companies. As their values Work Pilots lists easiness, trustworthiness and fairness. Two first of these are good values for both, to products and for the service. Fairness is a value, which fits for service and especially for the service, which cherishes the effectiveness of society. THANK YOU ALL FOR ONE MORE TIME – IT’S GREAT TO CONTINUE FROM HERE #TOGETHER!